St. Donan of Eigg, in the Scottish Isles, is thought to be originally from Ireland. He attempted to introduce Christianity to the Picts of Northwestern Scotland during the Dark Ages. The pagan Celts accepted the missionaries even when they did not accept their religion, due to the pagan and Christian symbols were found side by side on the great stones of Pictish. He ranks high among the Celtic saints. 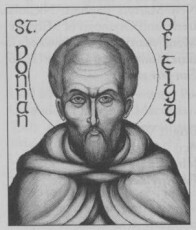 Donan and his fellow monks suffered the most dreadful case of martyrdom on the island of Eigg. He and fifty-two of his followers were butchered within the refectory of the Monastery. They only other martyrdoms recorded seem to be those of Constantine. Unfortunately the mediaeval life of St. Donan is lost, and what little we know of him is limited to the comments in ancient martyrologies. He was a contemporary of St. Columba. It is also believed he was Irish, and crossed to Galloway in early adulthood. The story of his martyrdom was well known in mediaeval Scotland and there are commemorations and veneration still present there today. We know that he crossed over to Lona, to meet with St. Columba, asking him to be his confessor. Donan eventually formed his community on the small island of Eigg, with monastic buildings. By the time of the massacre, it had become a large community. It is listed that fifty monks were martyred with him. Legend tells us that St. Donan was celebrating Mass when the intruders broke in. He begged for them to wait until Mass was complete, in which they agreed. They led the monks to the refectory, so as not to pollute the place where God had been worshiped, by the shedding of their blood. It is there that St. Donan and 52 of his Monks were beheaded, and then the building was set on fire. The date of the massacre was April 17th, 617. St. Donan is a saint from the Dark Ages. He is highly venerated as a Celtic saint. He was originally from Ireland, and crossed over to Scotland. It was here that he founded a monastery on the island of Eigg. He was a contemporary of St. Columba, and did much to spread the faith in the early Church. His monastery was raided and he along with fifty-two of his Monks were beheaded, and their monastery was burned down. He is the Patron Saint of Eigg, and his feast day is April 17th.